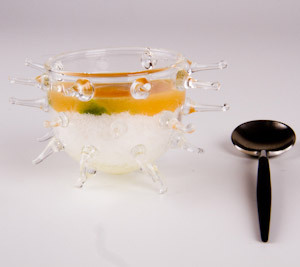 Innovation, investigation and illusion are the ingredients of this Mediterranean molecular gastronomy restaurant inspired by the sea at the small fishing village of Llanca, in Costa Brava. Molecular Meter: high, 9 course Tasting Menu and much more. Awards: Apart from several acknowledgements, Miramar exhibits a 2 Michelin Star award, and the other restaurant where Paco Pérez is Creative Chef has also received a Michelin Star. Such the case of Enoteca Restaurant, Barcelona. Address: Passeig Marítim 7 – 17490 Llanca, Girona.